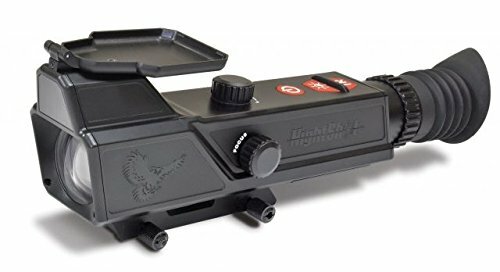 If you have decided to buy a night vision scope and started searching the internet for the one you probably feel overwhelmed right now. There are virtually thousands of products on the market, and it seems like an impossible task to find the one that will serve your purposes, will be of a reasonable price and high quality. These recommendations will help you make an informed decision about the night vision area, but before you make your choice, you need to understand how night vision works. In most people’s mind, night vision is the ability to see in the darkness. Well, yes and no. The truth is when you try to see the objects only with your eyes without an outside help you miss a lot. The human eye is arranged so that in the back of the eye there are cones and rods. They serve different purposes s though they both are sensitive to light. Cones allow a person to see colors but don’t work well in the dim light. Rods, to the contrary, don’t distinguish colors but see in the dim light. Night vision equipment doesn’t let you discern the colors, but it intensifies the available light. There is a mistaken opinion that night vision scopes are only used by soldiers or marine officers during the war. This is not so, especially in the last few decades. Night vision technologies became significantly cheaper and are more accessible to civilians. In particular, night vision scopes are popular among hunters. However, before obtaining this device check out your country’s laws regarding the night hunting because in some cases it is considered illegal. Apart from hunters, night vision scopes are often used by the owners of large properties for the sake of protection of their land. The same goes for personal security. Besides, sometimes night vision technologies are used in various quests organized for entertainment. As you see, the scope of their usage is rather broad. Thus, the demand creates supply. The variety of night vision scopes is enormous. They vary not only in prices but characteristics, and they also have some differences in how they can be used. Most importantly, you need to understand that today there are four generations of night vision sights. There are also Generation 0 scopes, but they are quite ineffective in the modern world. However, they may be appreciated by collectors of antiques. You probably understand that the higher the generation, the more expensive it is and the better the performance qualities it possesses. Gen 1 technology is fairly simple, not very expensive and performs all basic functions that hunters would need. These night vision scopes were introduced in the sixties and were used during the Vietnam War. They rely on passive infrared, and they do need the moon or some other light in order to work well. 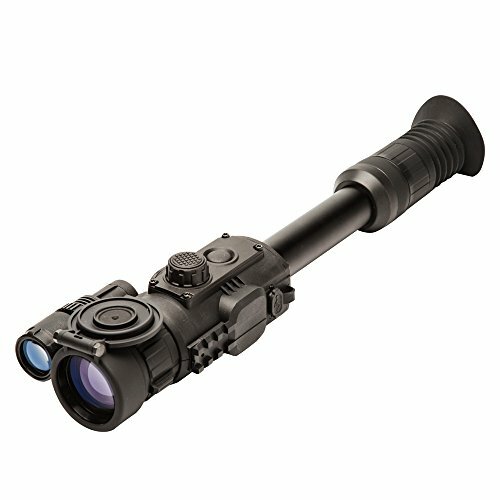 As it was mentioned earlier, these scopes will be ok for hunters but not for some tactical applications. The overall life expectancy of such optics is 1500 hours of use. Besides, they have shorter battery lifespan than the older generations. Obviously, these optics devices are more expensive and more advanced than the previous generation. They are also much lighter and more portable. Gen two night vision scopes are sometimes used by reservists and noncombat troops. Overall life expectancy of the optics is 4500 hours. It doesn’t need IR illumination. 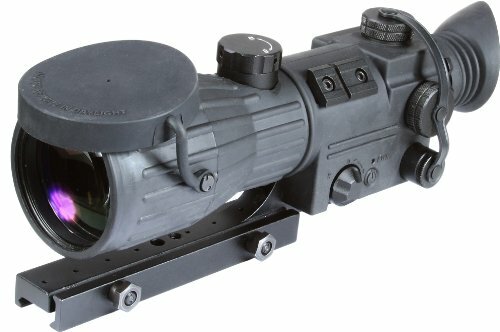 Gen 3 optics is currently used by the US military. It means this is quite an advanced technology, and of course, the price is much higher. Compared to Gen two scopes the clarity and resolutions have improved drastically. Their life expectancy is 10000 hours which is quite amazing. They work in all shades and conditions, and their sight range is 300 yards (compare it to 75 in Gen 1 optics, and 200 in Gen 2). 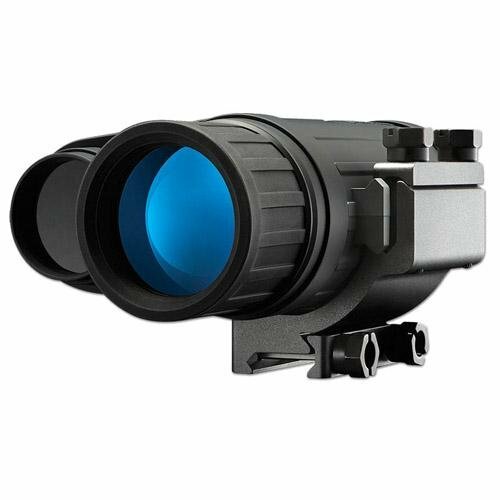 Though Gen 4 optics exists it is still quite rare to find in the market for the civilians. In these scopes, a protective coating was removed, which improved clarity by 20%. However, because of this, the tube’s life decreases, and it is not up to the requirements of the Department of Defense. The total amount of money that you invest depends on how much you will use. There are scopes that have interchangeable lenses, and this will allow using the equipment both for night shooting and day shooting. There are many night vision scopes that are not expensive and will meet the optimum standards. If you spend a few hundreds (or even thousands) dollars on the scope, you definitely want it to last long. If you are planning to add tubes, electronics and other specialized devices you need to realize that they will potentially be prone to failures and the scope’s lifespan will be shorter. Also, remember that night scopes rely on electronics so water could damage them. If you think that you might use your scope around water make sure you buy a waterproof one. When there is a need for the acquisition and use of night vision sights, the recognition range is more important than its overall range. So, one of the factors you need to pay attention to is that recognition range will be more than the total range. 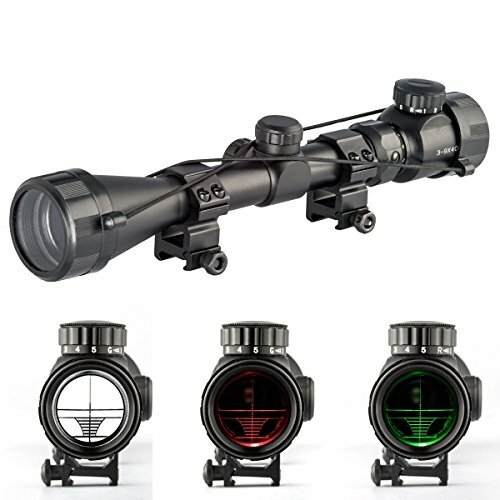 The range is measured by the amount of natural light so that you will find night vision scopes manufactured for overcast weather, starlight, quarter moon or full moon. Also, consider the fact that a longer scope usually produces more light. Obviously, a resolution is important both for tactical operations and for hunting. You need to be able to identify your target in either case. Resolution is measured by lines per millimeter (LP/MM). The clarity is better if the lines per millimeter are higher. This may be obvious, but it is still worth mentioning. If you are planning to walk a lot with your optics or do some off-hand shooting you want your scope to be lighter. High magnification of the scope means it will be heavier and bulkier and not very convenient to carry around. Besides, it will be more difficult to aim. There are night vision scopes with infrared illuminators, and there are some that allow attaching an IR to it. 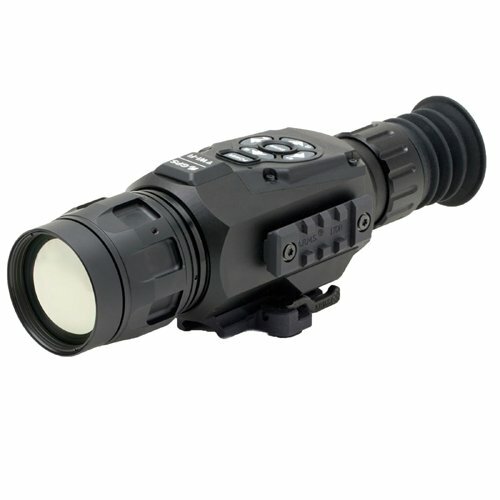 This light makes night vision brighter and allows spotting targets at long ranges. When picking a night vision scope, it is a good idea to buy one that has attachable infrared illuminators or even a spotlight. Unfortunately, IRs have a limited range and the more powerful ones are heavier. If you have reviewed all the performance factors but still don’t know which night vision scope to choose because there are hundreds of them in the market we would suggest paying attention to the following ones. 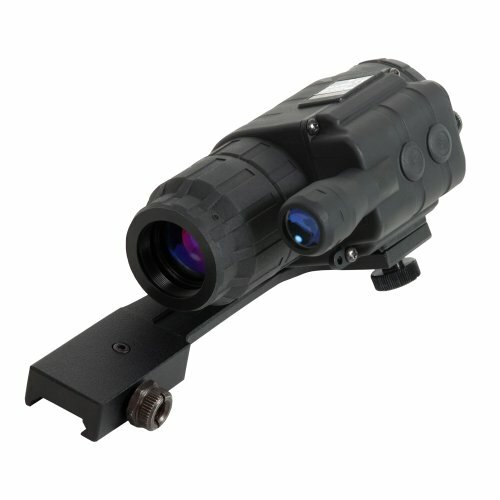 This night vision scope can be used in daytime and night. The magnification is 4.6x, and the resolution is 640×480. Thanks to these two factors you can see details at a distance of 120 yards easily. The sensor illuminates the surroundings and thanks to a built-in IR you can easily see the object which is at the distance of about 75 yards and even more. If you attach an additional IR this distance increases to 150 yards which is quite impressive. If you use this scope during the daytime, you need to have a lens cap secured. The scope includes six reticle options, which are: a German-style reticle, a Mil-Dot reticle for rangefinding, two reticles for varmint and hog hunting and two for 320, 350, 370 and 400 fps crossbows. The reticle options are in three colors – white, green and red. The device has a video output feature and provides an option for attaching additional accessories. The scope has a very user-friendly interface and menu that anyone will be able to navigate. The visual image is great at distances of about 100 yards. For bigger distances more expensive equipment with bigger lenses should be purchased. The scope is sold with several batteries, but they run low quite fast, so it is better to buy a rechargeable battery. There is a possibility to record videos and take photos in high resolution. The scope also has a WiFi streaming function when you connect it to your tablet of the phone. 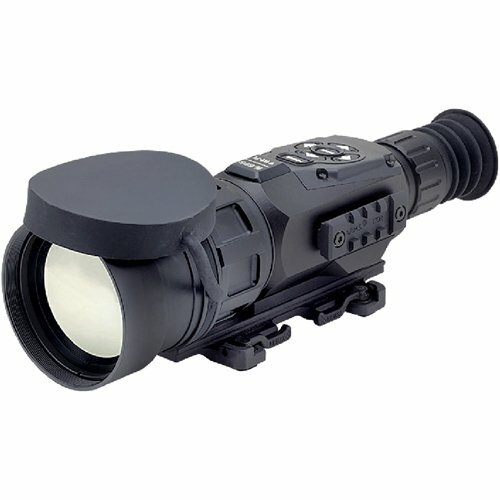 This night vision scope has a 384×288 sensor, which is ideal for the night because it detects heat energy rather than light. Thanks to this technology you will be able to see in complete darkness. 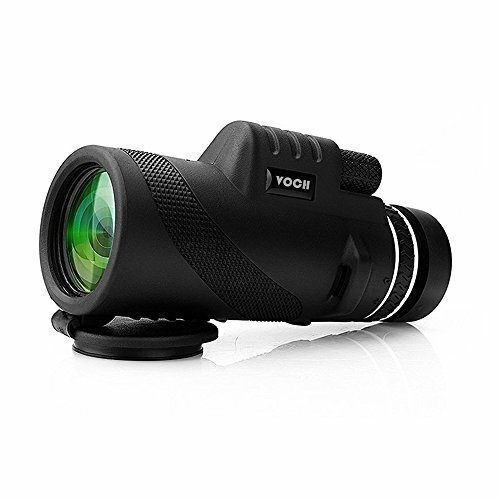 The scope has a smooth zoom that will let you magnify the target without losing acutance. The built-in ballistic calculator will calculate the direction of your bullet and will help you adjust your shot. The built-in rangefinder will help improve target shooting skills. This night vision scope is close to being perfect as far as the optics are concerned. It has a great onboard interface and can be connected to a tablet or a smartphone. Thanks to the onboard menu there is a possibility to turn off certain functions to save battery. The picture and external viewing are great. The GPS is very accurate and covers the needed altitude. It also includes a small IR flashlight that enhances visibility. 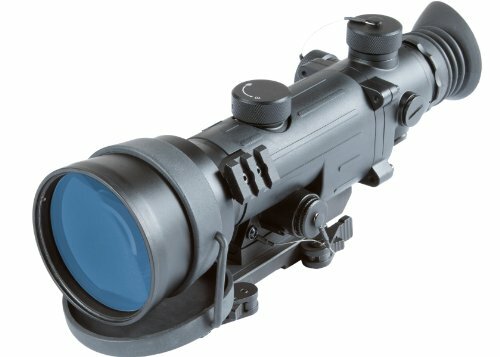 If this IR is not enough, you can buy a separate one and attach it to the scope. There is also photography and video function. One of the small disadvantages of the scope is that the light levels are adjusted manually: if you want to operate this scope at night, you need to remove the adapter. The focus knob is quite difficult to turn but starts working fine with time. These are just minor downsides to an overall great piece of equipment. 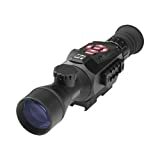 The scope provides both day and night vision in a variety of colors, and you can switch from day to night in literally seconds. 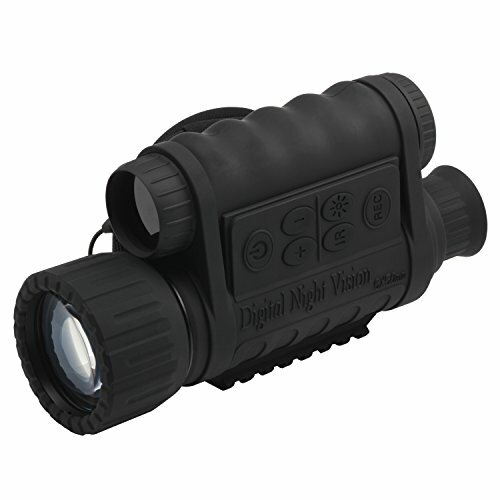 This is a kind of night vision generation 1, which has excellent opportunities for hunters. 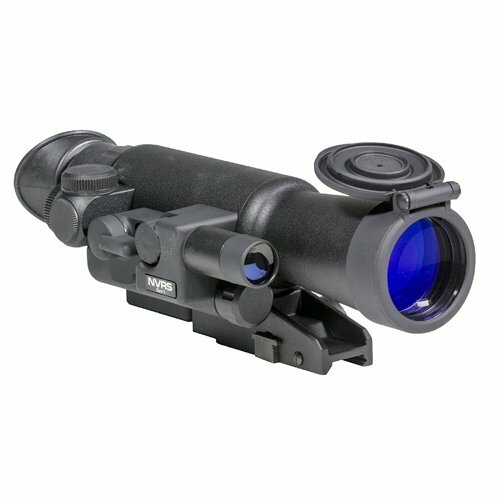 The body is titanium and this night scope is quite light and durable. Flip-up lenses help to withstand harsh weather conditions. 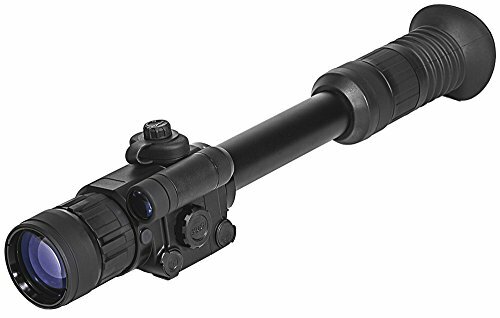 The scope features 3x magnification and 42mm lenses that provide higher light gathering capabilities and help to receive a clear picture of long and medium range targets. There is a built-in IR which can be adjusted manually. The battery life is as long as 50 hours without using IR and 20 hours with IR. Thanks to IR your vision in the darkness will be broader, and the image details will be enhanced. Though the scope can be used in the daylight, the image is quite low-quality and blurred. However, it works fine at twilight. 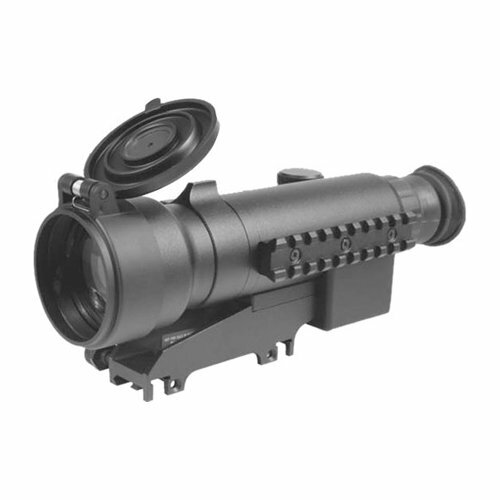 One of the biggest advantages of this optics is a quick-detach Weaver mounting system. It is very user-friendly, and you will be able to change optics without losing quality. 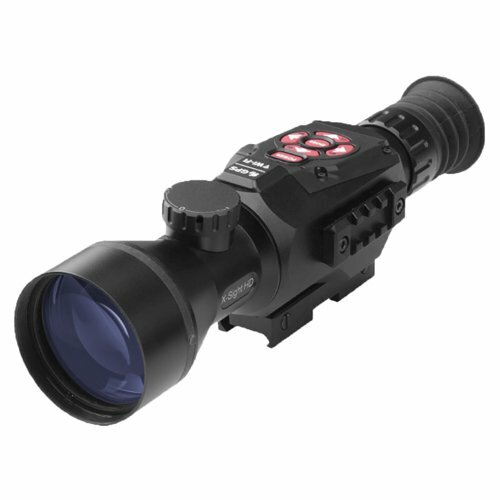 This is a 2+ generation night vision device with 2x magnifier and a detachable long-range IR. This scope is quite light (about 1.6 lbs), compact and easily portable, which is one of its most attractive features. It is also sand, dust, and waterproof, which allows using it in almost any weather conditions. The night scope includes a wireless remote control, which is quite convenient. You can choose which battery to use with your equipment – AA or CR123A. The scope is also equipped with a low battery indicator. It is easy to mount on your rifle, and you can also unmount it in seconds. The scope has adjustable reticle with brightness adjustment and multicoated glass lenses which help make your shot more precise. Thanks to manual gain control, which provides better contrast, the details are clearer and more distinct. You can use a night vision scope for multiple purposes. However, the most widespread use is for hunting. Choosing a scope depends on a few basic factors, the main of which is your budget and your needs. There are a lot of options available in the market, so you will be able to find one that will suit your needs and will not cost you a fortune. 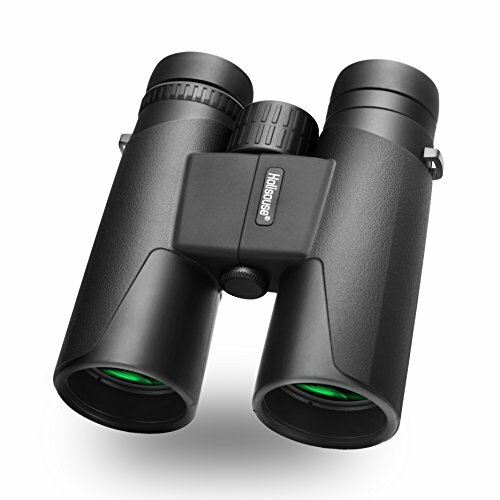 10X42 High Power Magnification - 10x magnification and a 42mm objective diameter. Have the best view in your outdoor adventures. To see 10X closer with a clear and bright image with 42mm objective diameter wide lens. Perfect for Hiking,Hunting,Climbing,Bird watching, Watching Wildlife and Scenery. Human Design - Dual-focus capability: non-slip texture design, you can adjust the clarity, to achieve accurate focus, the operation is very convenient; Adjustable eyepiece design: suitable for different visual acuity of the crowd, very user-friendly; Built in a tripod screw hole: Support the installation of a tripod stand to liberate your hands. Waterproof AND Fogproof - Prevents moisture, dust, and debris from getting inside the monocular - designed to inhibit internal fogging. Great for any weather and any environment. HIGH POWER FOCUS MONOCULAR. With 10x magnification and 42mm objective lens, you can see 10X closer with a clearer and brighter image, enjoy the beauty of the distance, and you will gain a amazing viewing experience. LARGE EYEPIECE AND FULLY MULTI-COATED OBJECTIVE LENS. 18mm large eyepiece with BAK4 prism, big field of view let you feel more comfortable when watching thing. The fully FMC multi-coated 42mm large objective lens make image more stable and bright. High color reduction let you feel the real wold. WIDE FIELD OF VIEW AND HD DUAL FOCUS. 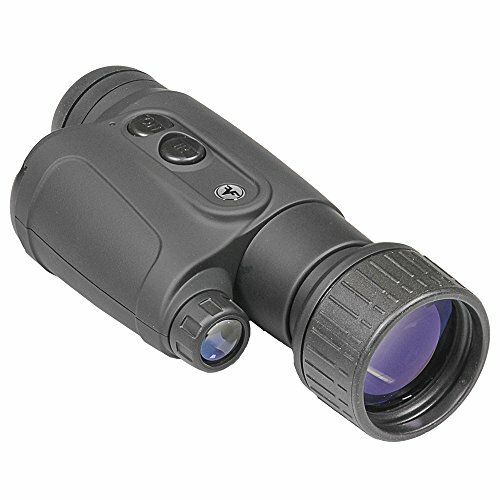 The HD monocular has broad view field, 419ft/1000yds(128m/1000m), and it will provide the farther scenery in your eyes. 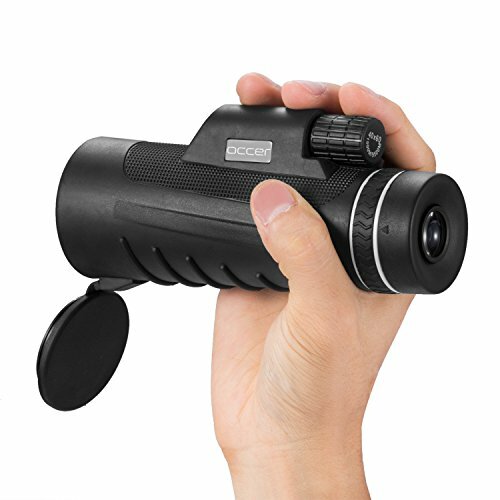 The HD dual focus in the zoom monocular, watching animals or other thing much more clear, and you can adjust the two focus knob slightly according to your sight.